LOS ANGELES -- The Los Angeles Lakers, the golden franchise that seemingly has everything, spent most of the season looking like beggars, an appearance they carried right through the end. Not even a rare gift in the form of a Utah Jazz loss that assured the Lakers a spot in the playoffs could alter their countenance. The Lakers went back to wandering the streets until they found enough change to pull off a 99-95 overtime victory over the Houston Rockets on Wednesday night. The particulars of this one included an 11-point Rockets lead in the third quarter that the Lakers eliminated to procure a late three-point lead that was eliminated by a long-distance Chandler Parsons heave at the fourth-quarter buzzer. So the Lakers had to go out and win the game again. Noah Graham/NBAE/Getty Images There is joy in Lakerland after all. with nary a victory to show for it. Injuries and disappointment have been the theme of this season, but at the moment it is not the final assessment. The Lakers live on. 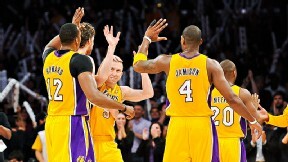 "Definitely expected more coming into the year," Steve Blake said. "A lot of people counted us out at one point. But we focused and we gathered ourselves and we got back on track." The mere fact that Steve Blake is the first person quoted in this story tells you how much things have turned around in Lakerland. But who better to offer his take after the way he has performed the past two games? His 24 points led the Lakers in this one, coming off the 23 he scored against San Antonio on Sunday. Blake felt licensed to fire jumpers at will. Kobe Bryant always had confidence to pass Blake the ball deep in the shot clock or late in the game if defenders converged on him. Now, with Bryant at home with his left leg in a cast, Blake doesn't have to wait on Kobe's discretion. The Lakers are rolling with a new approach, one that's a more traditional inside-out, counting on big men Dwight Howard and Pau Gasol to initiate most of the offense. And they're also leading the feel-good brigade in the Lakers' locker room. "We stepped up to the adversity of the challenge and we believed in ourself all the way," Gasol said. When the Memphis Grizzlies took care of the Utah Jazz earlier in the night, it clinched the eighth Western Conference playoff spot for the Lakers and spared them the ignominy of missing the playoffs with a $100 million roster. (It also spared writers from having to look up the spelling of "ignominy" on deadline). The Lakers could have stopped there. They also could have stopped when they were deep in the Western Conference hole before the All-Star break. that could have made us separate from each other," said Howard, who had 16 points and 18 rebounds. "But we stayed strong, we stayed together and we won for each other. We're happy that we're in the playoffs, but we're not done yet." By grabbing the seventh seed, the Lakers gave themselves the best chance to keep going. The top-seeded Thunder are even better equipped to hurt the Lakers the way the Rockets did most of the night, plus the Thunder play interior defense. The No. 2 seed San Antonio Spurs, the Lakers' first-round opponent, enter the postseason with injury issues of their own, and slid into the playoffs by losing their last six games against Western Conference playoff opponents (including the Lakers on Sunday in their first game after losing Bryant for the rest of the season). The Spurs have been a much better team than the Lakers this season, but the Spurs aren't at their best. After the Lakers, comically, offered numerous resets over the course of the season, this time it's authentic when Mike D'Antoni said: "We start 0-0." Can't be sure how much they will add. Nash's availability for the playoffs is uncertain. Nash participated in half-court, one-on-one drills Wednesday and that went well, according to D'Antoni. But it's a long way from half-court one-on-one to the NBA playoffs, and now Nash has only four days to get there. We keep waiting for the euphoria to wear off, for other teams to make adjustments to the way they are playing now, for the truth of the Lakers' lake of perimeter shot-creaters and diminished depth to catch up with them. Before the game, Rockets coach Kevin McHale had a telling forecast for the Lakers without Kobe: "When he doesn't play, there's always that kind of rush [for] everybody -- the ball moves a little bit more and stuff, and it all feels good for a while -- but eventually, you can't make up for what Kobe does. It all comes back to reality." For now, the reality is the Lakers have the seventh seed in the playoffs. Not sure when that seemed less likely, for different reasons: at the start of the season or in the middle. Just know this: They're smiling about it. MVP: On a night when some were wondering if Memphis would play its main players, Zach Randolph put up 25 points and pulled down 19 rebounds in an impressive performance. Defining Moment: Both teams shot terribly in the first half, but the Griz used a 25-13 third quarter to close out the game. With the season on the line, the Jazz managed only a season-low 70 points. disappointing: The stage was set for the Jazz to put pressure on the Lakers in the playoff race. Instead, the stingy defense of the Grizzlies and the uninspired play of the Jazz gift-wrapped a playoff spot for L.A.
MVP: Klay Thompson. On a night when the Warriors struggled to get it going but the Blazers were mostly worse, Thompson provided an efficient scoring punch. He was 5-for-7 from deep on mostly wide-open looks. 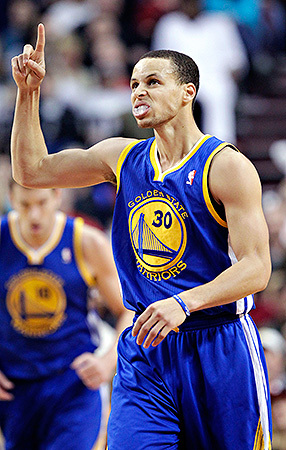 X factor: Steph Curry hit four 3-poiners to finish the regular season with 272, the most ever in a regular season. He overtakes Ray Allen for the record, a huge honor to cap one of the best distance-shooting seasons ever. perfunctory: The Warriors were playing for seeding, and the Blazers to avoid finishing the season on a 13-game losing streak, but there was relatively little urgency. Golden State can look forward to the playoffs while the Blazers have a big offseason. MVP: While he wasn't able to get it done offensively, Dwight Howard came up with some huge blocks late in the fourth and in overtime. In general, he completely closed off the paint to the Rockets' drivers. His 18 boards also helped. LVP: While he finished with 30 points, James Harden went 8-25 and overall looked very bad after the first quarter, getting blocked on crucial plays and holding the ball for far too long on countless possessions. vintage Pau: Said ESPN's Bill Simmons after the game. Messed around and got a triple-double. X factor: Scramble plays. Marcus Thornton and Jamal Crawford traded shots and lived off the chaotic play, but the Clippers were able to restore order a little more effectively thanks to Chris Paul. the end? In what may have been the last game in Sacramento, the Kings fought incredibly hard to the very end, even with the deck stacked against them. Now the fight moves away from the court. MVP: A career night from DeMarcus Cousins kept the Kings in it, but Jamal Crawford's two dagger 3-pointers eventually locked up the game and home-court advantage in the playoffs for the Clippers. MVP: Greg Stiemsma. Derrick Williams had 21 points, but Stiemsma drew a couple very big fouls on the block to keep the Spurs out of rhythm and at bay. He also managed 12 points, eight rebounds and an unexpected but welcome five steals. shockingly well-played: On a night when a bunch of other games had seeding implications, this relatively benign contest was fast and engaging until San Antonio lost its grip on it with about eight minutes to go. X factor: Turnovers. The Spurs turned it over 18 times and allowed 29 points off those turnovers. As strong as Tim Duncan's 17 points and 14 rebounds were -- all in the first three quarters -- he was also responsible for five turnovers. MVP: For a team supposedly lacking a true star, the Nuggets finished the regular season looking like they had one. Andre Iguodala scored 20 points and filled up the box score with 5 rebounds, 5 assists, 2 steals and 2 blocks. Defining moment: Pregame. When the Suns held out Goran Dragic because of an ankle injury, it was clear their minds were on next season -- or even the NBA scoreboard with futile hopes of a second lottery pick. smashtastic: Maybe it wasn't that the Nuggets got in transition for a flurry of dunks to lead 66-40 at halftime, but how they did it. Denver held Phoenix to 29 percent shooting. For the game, the Nuggets scored an insane 80 points in the paint. MVP: Chris Copeland burned the Hawks' defense with strong play on the perimeter and in the paint. He paced the Knicks' offense all night and ignited the initial run that put New York in front by double digits. He finished the night with 33 points. LVP: DeShawn Stevenson is known to be anemic offensively, but Wednesday night he was even worse than his reputation. He shot contested jumper after contested jumper, finishing the night 1-for-11. He missed all six of his attempted 3-pointers and failed to provide any defensive resistance. X factor: James "Flight" White and Iman Shumpert. Although Copeland provided the preliminary spark, White and Shumpert kick-started several runs. Shumpert finished with 18 points, eight assists and seven rebounds, while White finished with 20 points and six rebounds. MVP: Will Bynum scored 23 points on 10 shots. In a game few others cared about, it's tempting to say the pending free agent was playing for his next contract, but that wasn't the case. Bynum plays hard every moment of every game. uninspired: Neither team had the mental focus to show proper form on their jump shots (combining to shoot 28 percent outside the restricted area) or the physical willingness to defend the interior (allowing a combined 70 percent shooting in the restricted area). Defining moment: Mirza Teletovic adjusted his shoe while the Pistons took one free throw, allowing Andre Drummond to swoop in for the rebound and putback dunk. MVP: Carlos Boozer had a double-double, with 19 points and 15 boards. He also handed out four assists and played 38 minutes despite early foul trouble. He was the biggest reason Chicago outrebounded Washington 45-37. X factor: After the Bulls opened up a 21-point lead in the first quarter, A.J. Price single-handedly kept the Wizards within striking distance with a career-high 24 points and game-high plus-21 rating. Big-Brothery: Win or lose, the Bulls were the fifth seed on account of Atlanta falling to New York. The least Chicago could have done was let the Wizards win a close game and end the season on a positive note. MVP: Athletic swingman DeMar DeRozan scored 13 of his 24 points in the third quarter, helping the Raptors close out their season with a fifth consecutive win. Defining moment: Before the game, both teams gathered at center court to hold a moment of silence for the victims of the Boston Marathon bombings. In a further heartwarming gesture, Toronto fans cheered for the Celtics during the announcement of their lineup. meaningless: With the Celtics locked into the seventh seed, Kevin Garnett and Jason Terry got the night off, and the rest of the Celtics' starters played limited minutes. Now Boston turns its complete focus to the New York Knicks, their first-round opponent. Couldn't be a better time for a Pau revival. Gasol's seventh career triple-double helped the Los Angeles Lakers snare the seventh seed in the Western Conference playoff with a 99-95 OT win over the Houston Rockets. He had 17 points, 20 rebounds and 11 assists. Utah Jazz down beat: On a night full of last-game shenanigans with several teams having nothing to play for, the Jazz had plenty on the line. But they managed only 32 percent shooting and were outrebounded 57-47 in a game they needed to win to capture the last Western Conference playoff spot. Instead, they found themselves in the lottery land inhabited by Cats and Raps. "The energy is higher, the crowd is better, they turn the heat down a little bit in the arenas. Everything is just a little better. The lights are brighter. The popcorn smells fresh, they're not using the same popcorn. It's just something about it. When they show the video during games, [playoffs] coming soon, you get goosebumps." --Dwyane Wade, on the feeling of the playoffs, which begins Saturday. AP Photo/Don Ryan Stephen Curry in now No. 1 when it comes to 3-point shooting in a season. He sank his 270th in the second quarter of the win over Portland. Curry added two more 3s to finish with 272. Ray Allen's mark of 269 was set in 2005-06. Dwight Howard registered his 9,000th career rebound in the Lakers-Rockets game on Wednesday. Howard (age 27 years, 130 days), became the youngest NBA player to reach the 9.000-rebound milestone, besting the previous mark held by Wilt Chamberlain by just 14 days. Chamberlain was 27 years, 144 days old at the time of his 9,000th rebound. The only other player to accumulate 9,000 rebounds before turning 29 years old is Bill Russell (27 years, 357 days). MVP: I hesitate to call anyone in a clash between two cellar dwellers "dominant," but Josh McRoberts had an incredibly efficient game, amassing 20 points on 6-for-6 shooting and eight rebounds. X factor: Kemba Walker wasn't nearly as efficient as McRoberts, posting 24 points while going 6-for-16 from the field, but someone on this Bobcats team has to take difficult shots. Walker also did a nice job harrying Kyrie Irving on defense. arduous: Not the game, per se, but both teams have had long, unsuccessful seasons. They'll regroup this summer and hope to mount more convincing campaigns next season. MVP: Against the team that drafted him, Darren Collison dazzled in the finale. He pressured the Hornets on both ends of the floor and finished the game with a game-high 25 points. It was his second-highest scoring output for the season (season-high was 32 against Oklahoma City on Dec. 27). X factor: In the loss, Al-Farouq Aminu was a beast for the Hornets. He had 14 rebounds in the first quarter alone. He finished the half with a double-double by chipping in 10 points. He finished the game with 16 points and a career-high 20 rebounds. the finale: New Orleans moves on to next season as the Pelicans. For the Mavericks, the summer presents another pivotal moment. With cap space, they will have to figure out a way to get back into the playoffs after missing them for the first time in 12 seasons. MVP: Gerald Green, inasmuch as he has made a name for himself in the league, has done it with thunderous dunks. On Wednesday, he did his damage about 23 feet farther back. In a losing effort, the sub hit six 3-pointers en route to a career-high 34 points. X factor: Frank Vogel had Georgia on his mind. With his squad's 3-seed set in stone, the coach sat Roy Hibbert, David West, Paul George and George Hill in the regular-season finale. Things played out predictably, as the Pacers trailed the entire way. On to Atlanta. that: Despite a persistent and compelling chorus crying for the team to throw in the towel to improve its draft position, Philadelphia closed the season with a spirited 11-9 run. This will be Doug Collins' legacy. During this time, the Sixers' lottery seed plummeted from top five to out of the top 10. This will be his legacy, too. MVP: Brandon Jennings ran the show, but John Henson owned the game. Milwaukee's streaking rookie rumbled his way to an excellent line in his game-high 44 minutes, putting up 28 points and 16 rebounds against OKC's scrubs. He is now averaging 15-15 in his last five games. Defining moment: Down by just six points with about 40 seconds left in the game, OKC outright refused to foul and risk prolonging the night. That's right. The defining moment of the game was when OKC quite literally gave up. Doesn't reflect well how much this game meant. incredible: That may have been the absolute least inspiring win any NBA playoff team has ever achieved against a 60-win team. Milwaukee was down double digits to a D-League roster late in the third. They rallied only when Scott Brooks put in OKC's third-stringers. MVP: Dwyane Wade got in his final warmup with 21 points and 10 assists in 23 minutes of action in front of the home folks. Bring on the playoffs. X factor: The Magic loss, combined with a Bobcats win, gave the not-so-grand Floridians the NBA's worst record (20-62). They finished 46 games behind the Heat in the Southeast standings. Forty-six. On the plus side, they've got the best shot at the No. 1 pick. historic: Miami (66-16) became the 14th team in NBA history to finish with a winning percentage of more than .800.